Preheat oven to 450° F. Cut chicken into bite-sized pieces. Heat a small skillet to medium and add 2 teaspoons of olive or canola oil. Sprinkle the chicken with Italian seasoning and a pinch of salt and pepper, and sauté for 2 – 3 minutes. Add the broccoli and cook 2 – 3 minutes more, adding the garlic in the last minute of cooking. Place the crust on a baking sheet and spread with pizza sauce, leaving a 1/2" border around the crust. 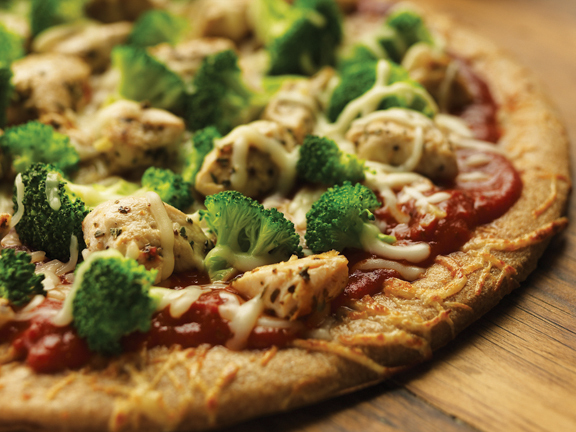 Layer the pizza with the chicken and broccoli mixture and cheese. Bake for 10 – 12 minutes until bubbly and light brown on the edges.